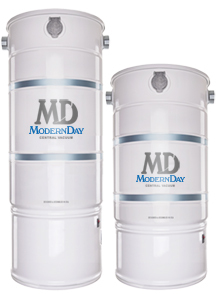 Modern-Day Central Vacuum Customer Ratings and Reviews - MD Vacuum. Upgraded my 2 year old Canadian unit with the Modern Day 715. I'm shocked at the huge power performance that this unit brings. I can really tell by hearing the massive air flow through my hide a hose and vac pans and seeing the dirt disappear. It is amazing! 5 stars, highly recommend!!! PURCHASE MD MODERN DAY 715. EXTREMELY DISAPPOINTED IN THE DECIBELS OF NOISE IT PUTS OUT. IT IS A HIGH SHRILL AND HAVE ONLY HAD A WEEK. IT IS IN THE GARAGE SO DON'T HEAR IT IN THE HOUSE BUT IS REALLY WAY LOUDER THAN IT SHOULD BE. THERE SHOULD BE A WAY TO DECREASE NOISE AND YES WE HAVE THE MUFFLER ON IT. I do not care for the open bag concept of the unit. The operation of the vacuum is very good, however. Quiet and effective cleaning. Old split level home has S-44 which has been great. Purchased F650t for our ranch home where we will move for retirement. We love our new central vac. We moved from a house that had one and our new MD is so much more! We plan to enjoy this for many years. Thanks for the install Owen! We absolutely love our Modern Day central vac. The suction is amazing and makes it a pleasure to use in the house. We have had a central vacuum for over 20 years and just had it replaced. This is an amazing system!!! I think this vacuum is terrific - now I must quality this by saying that this is the first central vac I've ever used! But it is extremely powerful. Excellent product. We love it!